December 5, 1908 -- An editorial page column extols the importance of motherhood to our country (how controversial!) 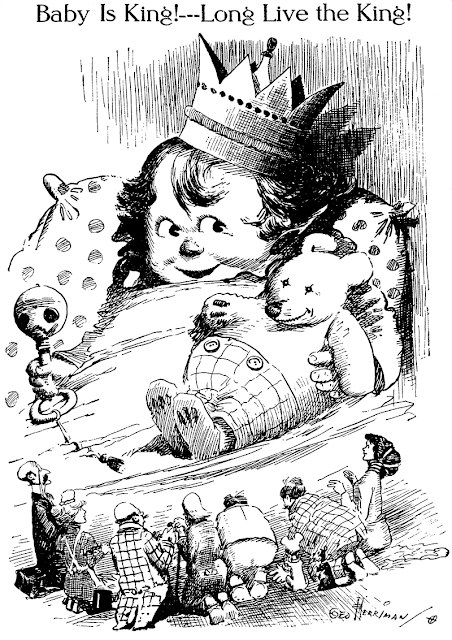 and Herriman, recruited to draw a cute baby, seems to have swiped from Rose O'Neill, if my eyes do not deceive me. Tsk tsk, George! The circumstances relating to the murder of the Rev. William Storre are given at great length and with much minuteness:—‘Not long since, there happened some controversey between the Lords and the rest of the inhabitants of Market Raisin in the Countie of Lincolne concerning the Commons and Libertie in the Towne Fields; and the matter being mooted by one of them in the Church immediately after evening prayer on a Sabaoth day, divers hot intemperate speeches passed among them; whereupon their Minister, whose name was Mr. Storre, much disliking so indiscreete a course, wished them to have respect both to the time and place where they were: And further advised, seeing the cause in hand concerned a multitude, (amongst whom, some of the least government would always be the readiest to speake) that they would therefore make choice of two or three of the fittest and most substantial men, to answere and undertake for all the rest. This motion seemed to please them well, and therefore they intreated him, that he would first, as a man indifferent speake what he thought concerning the cause. But he not wishing to intermeddle in that matter, twice or thrice denied their request; and the rather, for that there was present one Francis Cartwright, a young man of an unbridled humour, the only Sonne and Heire to one of the same Lordes of the Towne, betwixt whom and himselfe, there was growne no small unkindnesse. Yet in the end being pressed thereunto by their importunities with the consent of both the parties he delivered his opinion, useing therein such discretion and reasons to confirme the same that they could not directly except against him. Notwithstanding, seeing him incline more to the right of the Freeholders and the rest of the Commons than to favour their intended purpose, they seemed to dislike his speaches, and to cavill at the same. 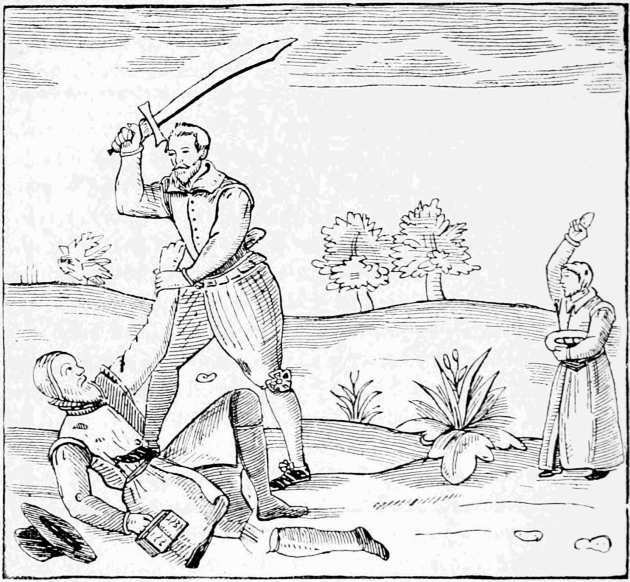 MURDER OF THE REV MR. STORRE, 1613. 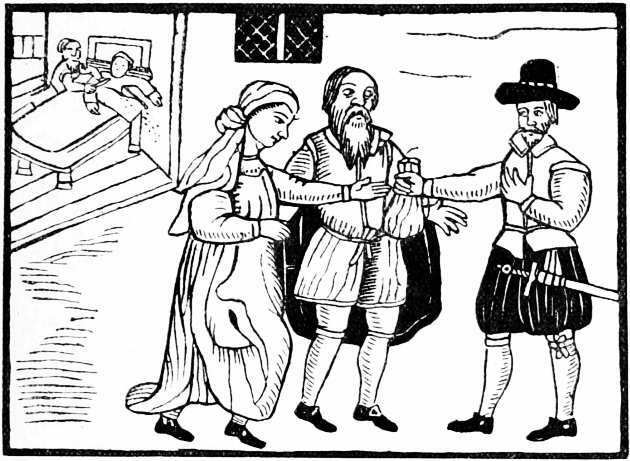 On the title-page of the pamphlet is a woodcut representing the murder of the Rev. Mr. Storre, which is copied above. The two other murders are not related at such great length, and are not illustrated. This is the earliest example I have met with of a kind of illustrated news that is very popular even in our own day. From the pains taken to describe all the circumstances of the crime and its consequences, the author evidently regarded it as a subject of the highest interest, and worthy of all the elaboration he was capable of bestowing upon it. NEWS FROM PENRHYN IN CORNWALL, 1618. William Lillo, the author of George Barnwell, is said to have founded his play of ‘Fatal Curiosity’ on this tract. Lillo was a prosperous London jeweller and a successful dramatic author. He depicted the harrowing details of this tragic story with great power; and the agonies of old Wilmot, the father, constitute one of the most appalling and affecting incidents of the drama. MIRACULOUS NEWS FROM MUNSTER IN GERMANY, 1616. 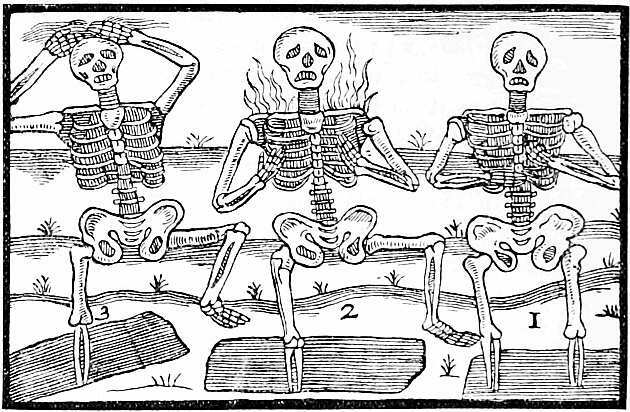 A curious black-letter tract of 1616, which is illustrated with a fearful apparition of three skeletons, is entitled, ‘Miraculous Newes from the cittie of Holdt, in the Lordship of Munster (in Germany), the twentieth of September last past 1616, wherein there were plainly beheld three dead bodyes rise out of their Graves, admonishing the people of Judgements to come.’ The truth of this miraculous news is vouched for by ‘divers worthy Persons and Burgimasters of the same citty,’ whose names are given. This miraculous appearance was preceded by a fearful tempest of thunder and lightning. ‘When this great tempest of thunder and lightning was ceased, there was heard throughout all the parts and places of the citty a most hideous and dolefull clamour or outcry, striking terror into all the people, yet no man could perceive whence it came, or where this clamour should bee. The people came over all the citty after the noise, but could not finde it; for when they were at one corner of the citty they then heard it at another; and when they were come to that other corner there it seemed to them to be in the middle of the citty; and to them that were in the middest it seemed farther off. So that all heard it, but none could find where it was, or from whence it came. ‘At length the people assembling in the churchyard behelde there so strange and incredible judgements sent by the Lord, that for the most part the beholders fell flatt on their faces to the ground, crying loude unto the Lord for mercy. For there they beheld coming out of their graves three most ghostly and fearfull dead bodyes. 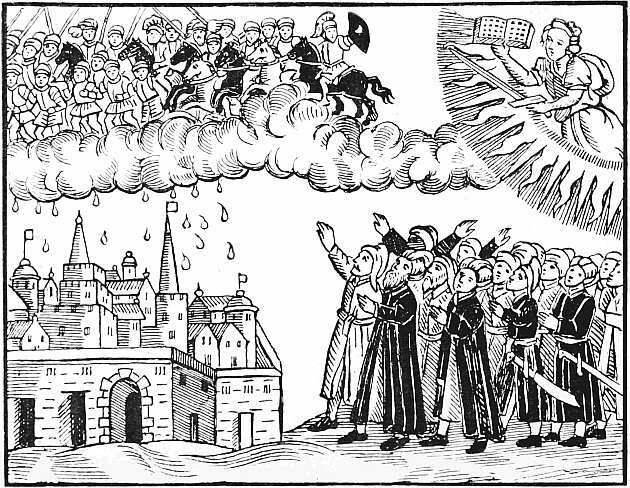 ‘Whereof the first that was seen to arise out of the earth, seemed very white, cleane, and cleere, who opening his mouth and beating his handes together spake thus: “Blessed be God in the highest Heaven, that our releasement is come, for we have wayted many a hundred yeare for this time.” The people hearing this fell upon their knees and prayed unto the Lord with weeping and great lamentation, saying: O Lord beholde us with thy merciful eyes, and let us not be overwhelmed or smothered in our sinnes. ‘The second dead man that arose out of the earth caused farre greater feare and trembling then the former, for the beholders saw him altogether from the toppe to the toe, like unto a burning fire; he likewise opened his mouth, and wringing his handes, and tearing his haire, cryed with a loude voyce: Repent yee, Repent yee; Almighty God hath taken his chastising rodde in hand, to punish the people for their sinnes, for their great wealth, for their great talke or presumptious wordes, for their pompe, and for their pride: The which the Lord will no longer suffer nor endure, for the cry and complaint of these sinnes is asended up into his eares; Wherefore hee will destroy you with a suddaine sicknesse, and fiery Pestilence, so that you shall not have so much time as one houre, to utter one worde, to call upon God. ‘After this fiery apparition and threatening speech ended, there appeared likewise rising out of the grave a third dead man, grinding and gnashing his teeth together, striking his handes the one against the other, and crying with a most fearful and hideous voyce, insomuch that it seemed to all the multitude there present, that the earth would certainly have rent in sunder; and spake that all the people plainly heard and understood his wordes, which were these; Woe, woe, woe, to the wicked; this is the time that wee have long attended and looked for; wherefore (ye people) looke to it, and beware lest the great day of the Lord come upon you suddainly, and fall upon you unprovided; for the time of his comming is neerer than you thinke. This account is supplemented by an ‘apology,’ setting forth that men must not be incredulous because they hear of miraculous occurrences—that God is able to bring back the age of miracles, etc. The writer evidently thought his readers might require to be strengthened by argument before they could place implicit faith in his narrative, and so he takes some pains in his ‘apology’ to convince them that however unnatural and uncommon may be the appearances he relates, the wickedness of the world was a sufficient justification for this and other extraordinary events. ‘GOOD NEWES TO CHRISTENDOME,’ 1620. In 1627 we come upon a very curious and literal example of illustrated news. In that year Charles I., having declared war against France, fitted out an expedition of a hundred sail and an army of 7000 men for the support of the Protestant cause in that country. The King’s favourite, the self-confident and vainglorious Duke of Buckingham, took the command of the expedition, although he was totally unfit for that position. He was personally brave, but possessed no other quality of a commander. He had no knowledge or experience of the art of war, and was too proud and presumptuous to be guided by the advice of others. The expedition was destined for Rochelle, then in possession of the Huguenots; but Buckingham went to sea without any understanding with his allies; and, when he anchored off Rochelle, he was refused admission to the town. He then directed his course to the neighbouring Isle of Rhè, where he succeeded in landing his men under the fire of his ships, and defeated a small French force commanded by the governor of the island. Instead of immediately following up his success, Buckingham allowed the French commander to secure and strengthen the fortress of St. Martin; and when he did advance he foolishly left the enemy in possession of another fort in his rear. He besieged the Castle of St. Martin for many weeks, and then led his men to storm the place without having made a single breach in the walls. They were repulsed at all points with considerable loss, and attempted to retreat to their ships; but Marshal Schomberg with a French army had thrown himself between the Duke and the fleet, and had put a strong corps and artillery into the fort of La Prèe, which Buckingham had left in his rear. No precautions whatever had been taken, and they suffered great loss before they could re-embark. The expedition was a total failure, and Buckingham returned to England beaten and disgraced. ‘Received the 27 of August. Whether the attempt on Buckingham’s life was a reality or was got up for the purpose of endearing the court favourite to all good Protestants, it foreshadowed his ultimate fate. In the following year, while he was at Portsmouth, and about to embark on a second expedition to Rochelle, he was stabbed by Felton, who had served under him in the expedition to the Isle of Rhè. ‘A gentle gale of wind then blowing from betweene the West and North-west, in an instant was heard, first a hideous rumbling in the Ayre, and presently after followed a strange and fearfull peale of Thunder, running up and downe these parts of the Countrey, but it strake with the loudest violence, and more furious tearing of the Ayre, about a place called The White Horse Hill, than in any other. The whole order of this thunder, carried a kind of Majesticall state with it, for it maintayned (to the affrighted Beholders’ seeming) the fashion of a fought Battaile. ‘It beganne thus: First, for an onset, went off one great Cannon as it were of thunder alone, like a warning peece to the rest that were to follow. Then a little while after was heard a second; and so by degrees a third, until the number of 20 were discharged (or thereabouts) in very good order, though in very great terror. ‘In some little distance of time after this was audibly heard the sound of a Drum beating a Retreate. Amongst all these angry peales shot off from Heaven, this begat a wonderful admiration, that at the end of the report of every cracke, or Cannon-thundering, a hizzing noyse made way through the Ayre, not unlike the flying of Bullets from the mouthes of great Ordnance; and by the judgement of all the terror-stricken witnesses they were Thunder-bolts. For one of them was seene by many people to fall at a place called Bawlkin Greene, being a mile and a half from Hatford: Which Thunder-bolt was by one Mistris Greene caused to be digged out of the ground, she being an eye-witnesse amongst many others, of the manner of the falling. ‘The forme of the Stone is three-square, and picked in the end: In colour outwardly blackish, some-what like Iron: Crusted over with that blacknesse about the thicknesse of a shilling. Within it is soft, of a grey colour, mixed with some kind of minerall, shining like small peeces of glasse. 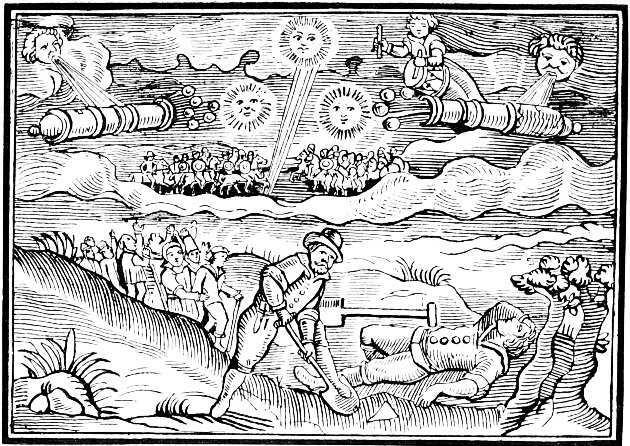 FALL OF METEORS AT BAWLKIN GREEN, BERKSHIRE, APRIL 9, 1628. Roy W. Taylor was born in Indiana in November 1876, according to the 1900 U.S. Federal Census. Newspaper reports said Taylor was 36 years old when he died in 1914, so his birth may have been in 1877 or 1878. In the 1880 census, Taylor was the youngest of two children born to William, a gardener, and Mary. The family lived in Richmond, Indiana at 32 South Sixth Street. The Evening Star (Washington DC), October 21, 1914, said a young Taylor stayed with an uncle in Chicago where he studied art and married. 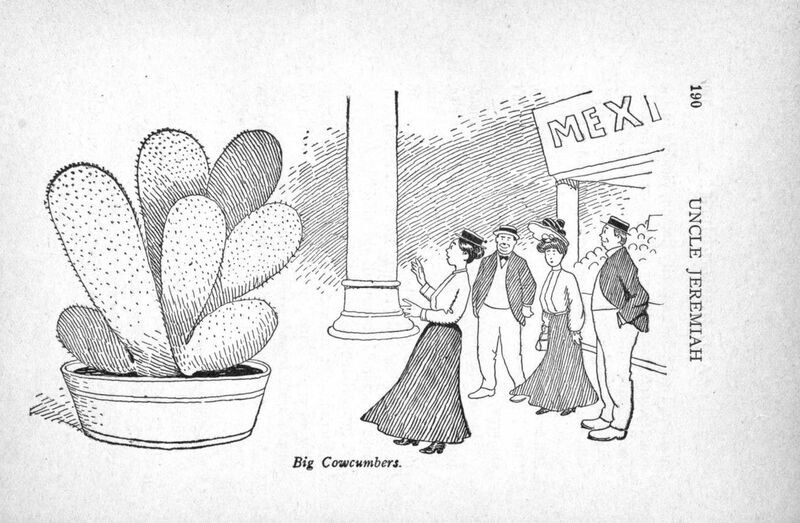 A nearly identical listing was in The Annual American Catalogue 1898. Taylor also illustrated the books, Uncle Jeremiah and His Neighbors at the St. Louis Exposition (1904) and Peck’s Bad Boy Abroad (1905) with D.S. Groesbeck. Taylor resided in Chicago, Illinois at 242 West 66th Street as recorded in the 1900 census. His occupation was newspaper artist. American Newspaper Comics (2012) said Taylor drew three dozen comic series including Ain’t it Awful, Mabel?, Alice’s Adventures in Funnyland, Can You Beat That, Sadie?, The Hungry Five, Little Lovey Pett, Professor Bughunter, and Unlucky Looie. Taylor has not been found in the 1910 census. Taylor passed away on October 21, 1914, in Washington, D.C. His death was reported that day in the local paper, the Evening Star. His Comic Pictures in the Papers Have Pleased Thousands of Children. Roy. 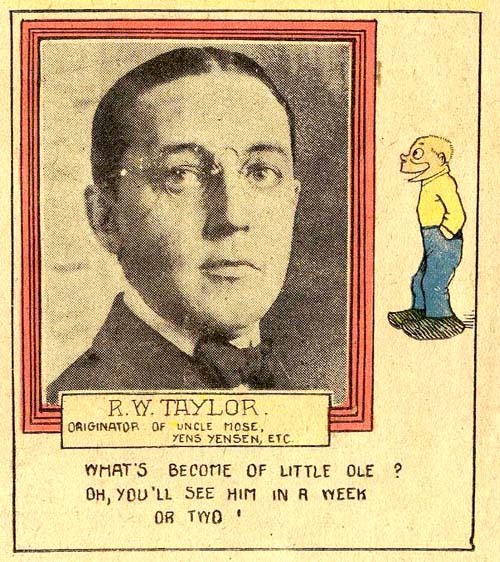 W. Taylor, cartoonist, died at the home of his mother, Mrs. A.L. Marshall, 723 3d street northwest, early today. He was thirty-six years old. Funeral services will be held at the house tomorrow afternoon at 5 o’clock, after which the body will be sent to the old home of the deceased at Richmond, Ind. At the time of his death Mr. Taylor was employed on the Philadelphia North American, and came to Washington some weeks ago when he felt that he was gradually growing weaker and did not have much longer to live. Previous to this employment he was attached to the art staff of the New York World and the Chicago Tribune, his cartoons in the Sunday comic sheets giving thousands of children entertainment. When a mere youngster, Mr. Taylor went to live at the home of an uncle in Chicago, where he had an opportunity of studying art. He showed steady progress, it is said, and at the age of twelve years his first comic cartoon was published by a newspaper. His progress was steady and within several years his cartoons became known in many parts of the country. He married in Chicago several years ago, but shortly thereafter his wife became ill and after lingering for over a year died some months ago. The Indianapolis News (Indiana), October 23, 1914, reported the burial plan. The body of Roy W. Taylor, a cartoonist, who died here Tuesday, was taken to Richmond today for burial. Mr. Taylor, who was thirty-six years old, was born and reared in Wayne county. He had been employed on the Chicago Tribune and the New York World, and was on the staff of the Philadelphia North American at the time of his death. His mother, Mrs. A. L. Marshall, of this city, survives him. An earlier Roy W. Taylor profile appeared in 2012. Although Roy W. Taylor spent most of his time in Chicago working for the Chicago Daily News, he did have two brief flings with the Chicago Tribune, once in 1901, and then again in 1905. In his second go-round he never could seem to come up with a series that really stuck. Little Lovey Pett, for instance, ran just over a month in the Tribune's Sunday color comics section. It didn't deserve much longer life, frankly. It was a melange of The Newlyweds (parents who dote on their misbehaving child) and the million and one strips about prank-pulling little devils. 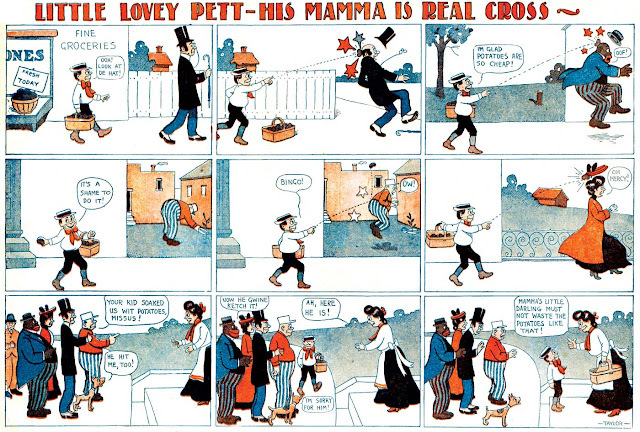 Since the pranks weren't at all inventive, the strip left the reader more angry than entertained, mainly wanting a crack at giving the little fink some tough love. Roy only gave the audience want they really wanted in the final sample above. 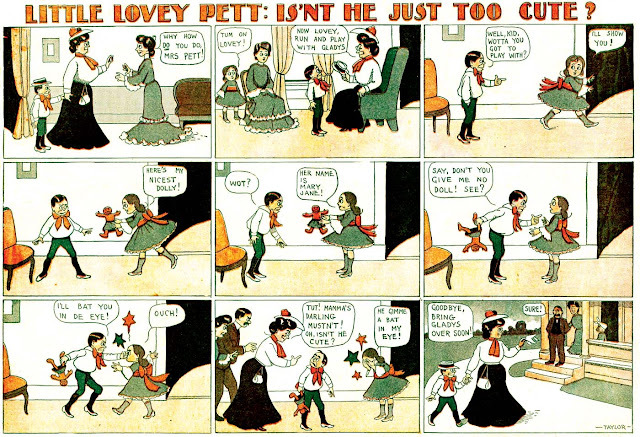 Little Lovey Pett ran from October 22 to November 26 1905. Thanks to Cole Johnson, who supplied the sample scans. You can see the all the strips in this series over on Barnacle Press. These very early Steve Canyon themed clothes from 1948 are exceeding rare, as best I can tell. Here's a guy who has one of the sport shirts, very cool design but its sure seen better days. 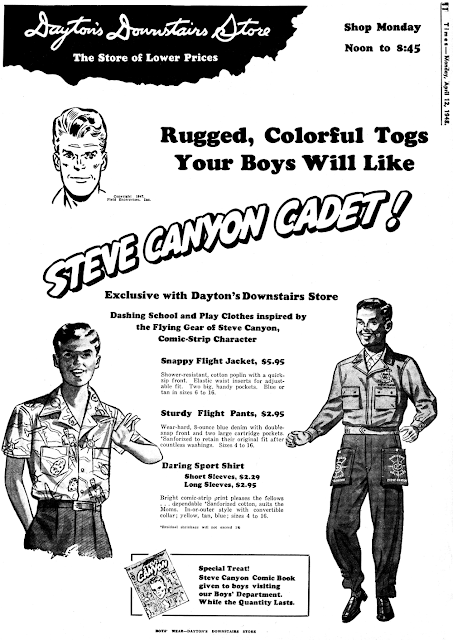 I think I could live without the weird cargo-pocket 'flight pants', but if anyone wants to start reproducing those shirts, sign me up for one! 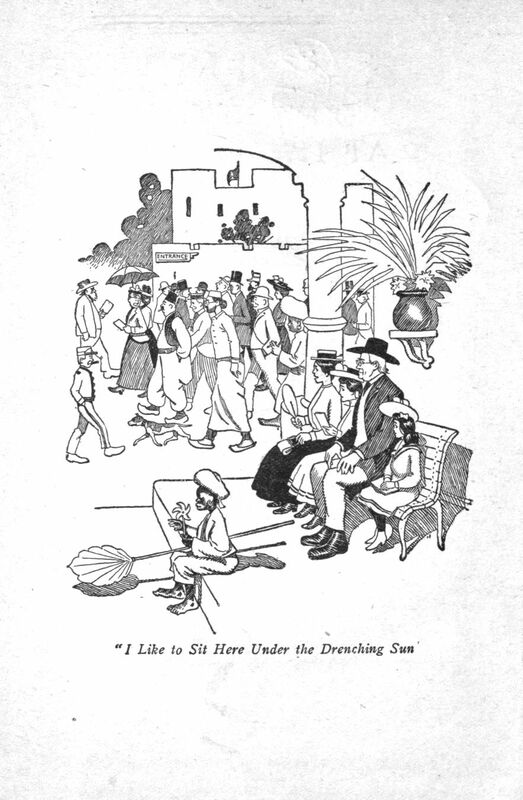 In the late 1890s, the great illustrator/cartoonist E.W. Kemble produced several series for Hearst's New York Journal. 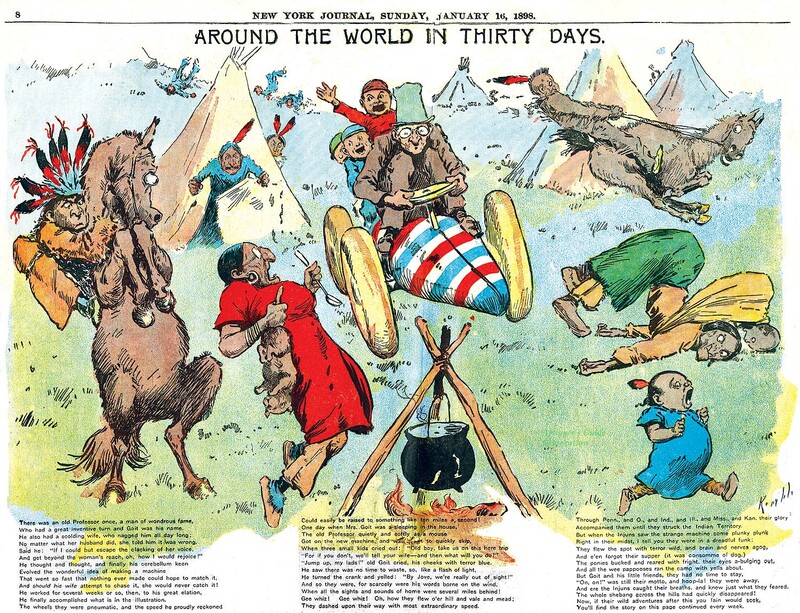 One of his series, Around the World in Thirty Days, took its title very seriously, and only appeared in the Journal's comic section for a mere month -- from January 3 to February 6 1898. 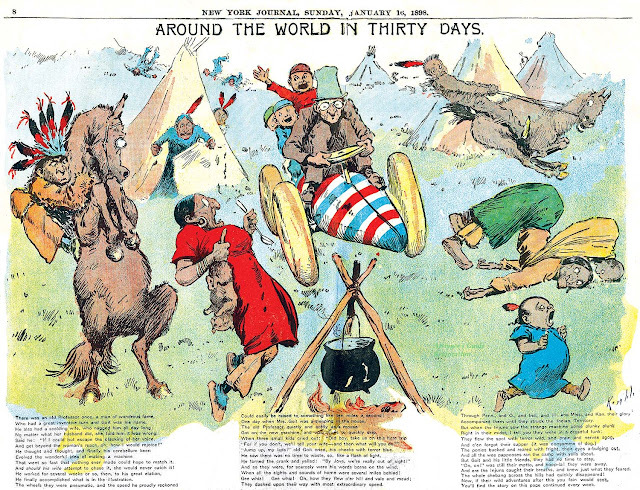 In this series, Kemble shows how far we've come from Jules Verne's 1872 mark of 80 days to make a circumnavigation. With the newfangled automobile, specifically Mr. Doit's candy-striped super-duper model that can manage 10 miles per second (! ), the same stunt can easily be accomplished in less than half that. Along the way, Kemble gives a master-class in expressive drawing, and his customary highly un-PC takes on the non-white races.